It’s interesting how a recipe comes together. Last week, I posted my recipe for Flour-Dusted Roast Chicken to my Facebook page, and my fan Maggie said something about wanting a beef recipe. 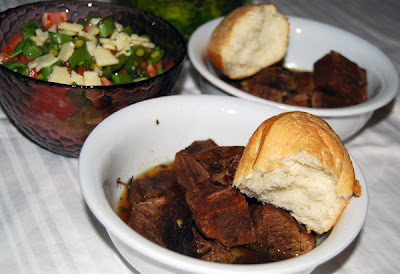 Near the same time, another fan, Susie, shared with me her son’s recipe for “Lomo con Ajillo” (Pork with Garlic), and yet another fan, Jennifer, mentioned that she relies on her slow cooker. Put them all together, and what do you get? 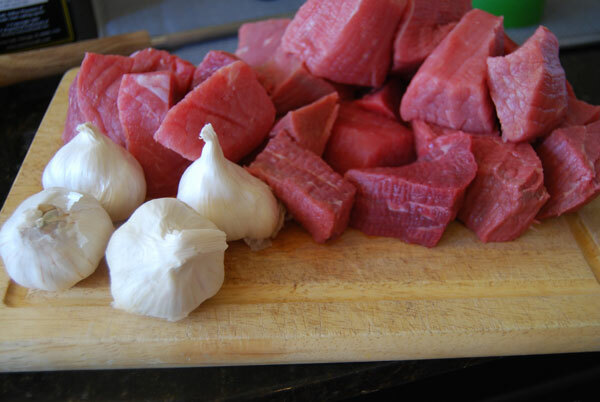 My recipe for Slow-Cooked Beef with Garlic and Red Wine. Dedicated to Maggie, Susie, and Jennifer, even though Jennifer’s kids won’t eat anything beefy. I served this with a simple salad tossed with vinegar and oil, and a hunk of fresh bread from the store. By the way, the next time I make this, I’m going to spring for the pre-peeled garlic cloves from the store. I can’t imagine they’re that expensive, and I’m willing to pay a couple bucks to avoid having to peel 40 cloves of garlic in one shot. Brown the meat on all sides, in batches. (Don’t overcrowd the pan you’re using to brown the meat.) 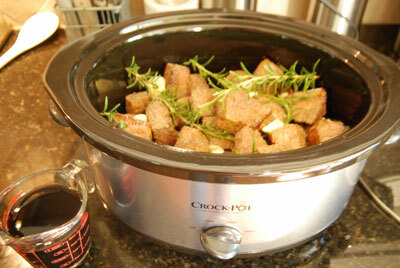 Add the meat, garlic cloves, and rosemary sprigs to the slow cooker. Sprinkle with salt and pepper. Pour in wine and the accumulated beef juice from browning. Cook on low for 6-8 hours. Serve with a salad and bread for dipping.